Lots of mainstream media attention this week relating to a new type of antibiotic that is able to kill that increasingly resistant bacteria MRSA. The small patient trial was able to demonstrate that this new enzyme derived from a virus that infects bacteria, was able to clear MRSA skin infections. What does this mean to rosacea sufferers? Before we understand any possible relevance to rosacea sufferers lets look more closely at the announcement. Presenting results at the Antibiotic Alternatives for the New Millenniummeeting in London yesterday, firm Micreos reported data from a small patient trial of Staphefekt, a bactericidal enzyme derived from bacteriophages (viruses that infect bacteria) in six patients with MRSA skin infections. The efficacy of typical topical antibiotics such as Clindamycin (Cleocin) and Erythromycin (Akne-Mycin) has not been impressive. Rosacea sufferers do not generally find that a topical antibiotic is able to satisfactorily reduce rosacea symptoms. Being treated with system antibiotics has long been a mainstay of rosacea treatments. Topical antibiotics have shown little results by comparison. Do you have MRSA or MSSA ? If you have an infection of either of these bacteria on your skin then you probably have other more serious concerns than rosacea. This could include a weakened immune system or damaged or compromised skin. The question then is does your redness, stinging, burning, irritation, papules and pustules, as claimed by the company, may be related to an S. aureus infection. We are told by the company that Staphefekt directly targets only the Staphylococcus aureus bacterium, so should leave the other flora of the skin untouched. This is good news for concerns about antibiotic resistances and affecting the overall skin health. 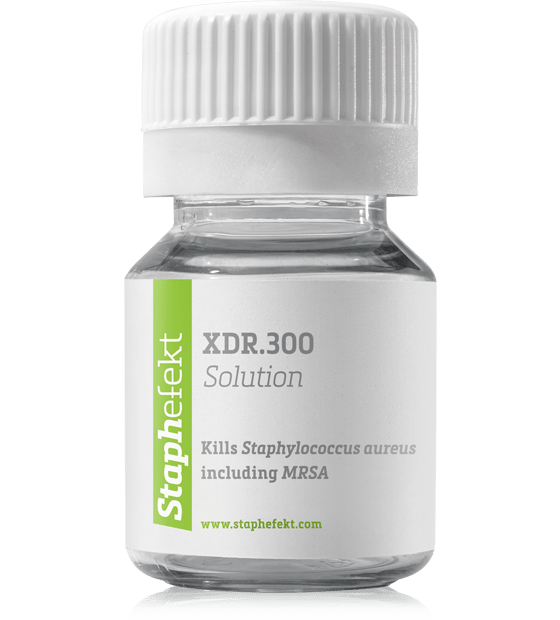 Note that Staphefekt is only available as a topical, so is only indicated for skin infections. How do Tetracyclines help Rosacea ? SIBO Eradication Clears Rosacea (Rifaximin/Xifaxan): are you serious ?